Solinure is the dependable “workhorse” of the specialty agriculture range. You can depend on the product purity, ease of use and crop response with Solinure. The cleanest raw materials on the market result in a product that is trouble-free during mixing and applications. Also the trace elements and NPK analysis are ideal for soil-based applications of fruits and vegetables. Solinure gives the results you can depend on. 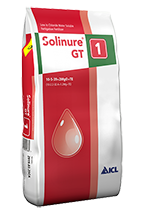 The Solinure GT line contains 8 formulations that can be used in greenhouse and tunnel systems. The formulations are low in urea, they cover the basic magnesium need and the specially designed trace-mix is fully chelated. The Solinure GT line does not contain chlorides and holds the minimal amount of urea possible.